There's nothing like a new jacket. They're one of my favorite things to buy and wear. Maybe it's because I'm from New England, where we wear some sort of jacket for 9-10 months out of the year... ;) but I find that there's nothing like a jacket to dress up an outfit. It doesn't matter what you're wearing underneath - with the right jacket, you can throw it on and go out feeling like a million bucks. Looking for a cute new jacket to welcome Fall? NVMBER 9 (also known as "NVM 9") sent me their awesome black wax jacket to try out. This jacket has the perfect look - edgy but with clean lines and super cute Swarovski embedded buttons! It has steel tooth zippers that looks super polished. And this jacket is cropped, which keep the look fresh and very modern. (And great for that layered look!) It's made of NVM9's patented wax rubbed denim so it has a very unique feel & texture. My husband loves this jacket on me. The first word out of his mouth was 'hot!' and I have to say I agree. Before I even put it on I knew it was love. 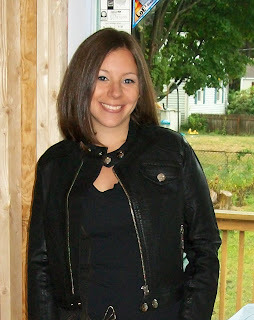 :) This jacket is very versatile - it looks great with jeans or pants or even over a dress! NVM9 has a ton of other very hip pieces, from skinny jeans, to mini skirts, to jumpers and bermuda shorts! Check out this hot houndstooth skirt (right) and this adorable pink 'British plaid' jacket (below)! I love NVM9 because their fabric patterns are so fresh and unique! In 2004, denim designer Ary Harrouch and production specialist Zuri Anzaruth forged a friendship and business partnership that would one day inspire Nvmber 9. Between the two of them were the means to invest in their passion, one state-of-the-art sourcing company, and over six decades of experience in the fashion industry, an unquestionably irreplaceable asset. Together, the young team of designers travel the world studying the latest fashion trends, churning out bold new designs with classic inspirations, hot new fits with timeless gunmetal and Swarovski crystal trims, beautiful washes with carefully designed stitch details, and fresh, colorful takes on time-tested elegance. Zuri’s team sources the highest quality fabrics, including incredibly soft Japanese denims, luxurious velveteens and sateens, leathers, corduroys, and more, and keeping costs low by producing in-house. These savings are passed along to the consumer, who can turn to Nvmber 9 for cutting edge fashion of the highest quality at a fraction of the cost of today’s high-end streetwear. Buy it: Make a new account on the NVM9 web site and get $10 off your order! WIN IT: One lucky Frugal & Fabulous reader will win their own NVM9 Wax Denim Jacket! *Tell me what your favorite item is from the NVMBER 9 web site! You have until Tuesday, October 6 @ 7pm EST to enter! (Winner must respond within 48 hours.) Giveaway open to U.S. residents only. My name is Megan Scott, e-mail mnscott@ballstate.bsu.edu. I love the black wax skinnies on the Site. The star pants are so cute! Love the black wax biker jacket on the site! I looked at all the products and the jacket up for the giveaway is definitely my favorite! I agree with your hubs too "HOTT!" I entered the CaliBowl Giveaway over the weekend! I love the 9 Blue Skinny jeans. Following @nvmber9 and @lindsfrugalfab on Twitter and tweeted. I love the black houndstooth skinny pants! The wax denim jacket is my favorite from the website! I entered the Calibowl giveaway. You have great giveaways! I like those dark star skinny jeans. ps - you look super cute in that jacket! I adore the black wax jeans and the straight line wax skirt! I entered the CaliBowl Giveaway too! I love the LIMITED EDITION DARK STAR BERMUDAs! They're just gorgeous! I really like the 9 Blue Skinny jeans. I entered the "Giveaway & Review: Cali Bowls!" Name is Ann! And I really like the black jacket that you're giving away! But the black leather jacket is also nice looking!! I adore the Black Wax Skinny. Those zippers up the ankles are to. die. for. Those jeans are just too killer for words!!! I entered the Nimli giveaway! I like the LIMITED EDITION Dark Star Bermuda. Very cute! Thanks for the giveaway. I love the LIMITED EDITION Dark Star Bermudas. Just entered you Nature Valley Nut Clusters giveaway! I like the Black & White Houndstooth Jumper! I liek the Black and White Houndstooth Skirt. I follow on Blogger and Google. I entered the Pashima giveaway. I entered the Cali Bowl giveaway. I'm not usually a fan of this print...but I just LOVE the Black & White Houndstooth Skinny pants. I entered the Nature Valley giveaway. I entered the OfficeMax / Avery giveaway. I am a Facebook fan of NVM9 (Aimee Waerhouse). I am a Facebook fan of Frugal & Fabulous (Aimee Waerhouse). I entered the Avery giveaway too! I love the 9 Blue Skinny jeans - thanks! i love that pink plaid jacket! My favorite is the Black & White Houndstooth Skinny Pants. I also entered the Office Max/ Avery giveaway. classic plaid side zipper jacket! loving the 9 Blue Skinny jeans!!!! I entered the fortune cookie giveaway! My favorite item (other than the jacket!) is the Black Wax Skinny jeans. Love them! I also entered the Nature Valley Nut Clusters giveaway! I subscribed to your blog via email - and I'm a new subscriber! I like the Black Wax Biker. Thanks for the giveaway! Entered the Nature Valley giveaway. Fave item is THIS JACKET! Love. The Dark Star Burmudas are my fav, but I LOVE this jacket as well! I just love the Houndstooth Jumper in Mustard & Eggplant. Its perfect for my grand daughter--and so is the jacket! Thanks for the chance! i think i just fell in love! and the black skinnies and this jacket are my favs! Anh Nguyen, anhesty at gmail dot com. I really liked the 9 Blue Skinny Jeans. Skinny is so in this season. I subscribe to your blog via feed burner. I have also entered your Nature Valley Snack Pack giveaway. I love the 9 Blue Skinny! I cheked out the NVM 9 site and although I most most of their products really cool, it was the Black Wax biker that I liked the most! In fact, I love it, it gives off an aura of both danger and elegance! Thanks for giving all of us a chance to win this thing!